If you don’t know, Apple launched possibly it’s riskiest new product in years last week. The AppleWatch has the Cupertino tech giants staking their bets for the next few years on a tech/fashion revolution, and I don’t mean coats with solar panels & iPhone chargers. You can debate the credibility of the Apple Watch as a fashion gadget all day long, but one area where it undoubtably excels is in fitness. 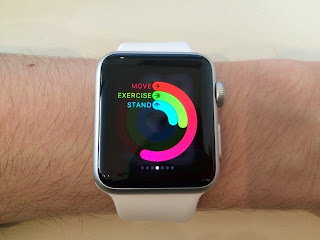 Apple uses an approach to fitness tracking well known in technology circles as “gameification”whereby you are rewarded for meeting individual goals, both small and large, the aim being to addict you to fitness. This process of regular reward is often hailed as part of the reason services like Twitter have caught on. With each favourite, reply & re-tweet feeding your desire for more. 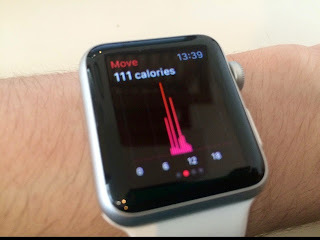 When it comes to the apple Watch, Apple asks you to set a daily fitness goal in the form of calories. It then presents you with an intuitive wheel of progress, available at a glance from the watch. I have to say this really works. I found myself regularly checking my progress, even going as far as wondering round the house in a bid to add that extra little bit towards my move goal. I even started running! Anyone who knows me will tell you just how much of an achievement that is,namely because running is usually excruciatingly boring. The Apple Watch lets you record data for various different types of exercise, as well as general movement tracking. You can record runs, cycle rides, rowing sessions and anything else you feel like. Various Apple Watch users have even taken it for a swim, although this isn't recommended. 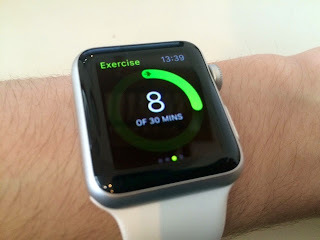 London Marathon after using it to train and you can find her Apple Watch blog here.